In Greek mythology, Thanatos (in Ancient Greek, θάνατος – "Death") was the Daimon personification of Death and Mortality. He was a minor figure in Greek mythology, often referred to but rarely appearing in person. His name is transliterated in Latin as Thanatus, but his Roman equivalent was Mors or Letus/Letum, and he was sometimes identified (perhaps erroneously) with Orcus. The Greek poet Hesiod established that Thanatos was a son of Nyx (Night) and Erebos (Darkness) and twin of Hypnos (Sleep). Homer also confirmed Hypnos and Thanatos as twin brothers in his epic poem, the Iliad, where they were charged by Zeus via Apollo with the swift delivery of the slain hero Sarpedon to his homeland of Lykia. Counted among Thanatos' siblings were other negative personifications such as Geras (Old Age), Oizys (Suffering), Moros (Doom), Apate (Deception), Momos (Blame), Eris (Strife), Nemesis (Retribution) and even the Stygian Boatman Charon. He was loosely associated with the three Moirai (for Hesiod, also daughters of Night), particularly Atropos, who was a goddess of death in her own right. He is also occasionally specified as being exclusive to peaceful death, while the bloodthirsty Keres embodied violent death. His duties as a Guide of the Dead were sometimes superseded by Hermes Psychopompos. Conversely, Thanatos may have originated as a mere aspect of Hermes before later becoming distinct from him. Thanatos was thought of as merciless and indiscriminate, hated by - and hateful towards - mortals and the deathless gods. But in myths which feature him, Thanatos could occasionally be outwitted, a feat that the sly King Sisyphus twice accomplished. When it came time for Sisyphus to die, he cheated Death by tricking him into his own shackles, thereby prohibiting the demise of any mortal while Thanatos was so enchained. Eventually Ares, the bloodthirsty God of War, grew frustrated with the battles he incited, since neither side suffered any casualties. He released Thanatos and handed his captor over to the God, though Sisyphus would evade Death a second time by convincing Persephone to allow him to return to his wife. Thanatos is usually an inexorable fate for mortals, but he was only once successfully overpowered, by the legendary hero and demigod Herakles. 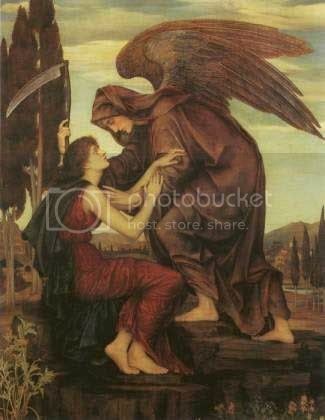 Thanatos was consigned to take the soul of Alkestis, who had offered her life in exchange for the continued life of her husband, King Admetos of Pherai. Herakles was an honored guest in the House of Admetos at the time, and he offered to repay the king's hospitality by contending with Death itself for Alkestis' life. When Thanatos ascended from Hades to claim Alkestis, Herakles sprung upon the god and overpowered him, winning the right to have Alcestis revived. Thanatos fled, cheated of his quarry.